This paper explores the implications for creating a U.S. history narrative from a Rortyan perspective. First, we review Rorty’s social theory. Second, we discuss implications of his ideas regarding the creation of a U.S. history narrative based upon his ideas. Finally, we examine two concerns that would likely emerge if a Rortyan U.S. history curriculum was taught in our public schools. Jesse Goodman, Sarah Montgomery and Connie Ables. 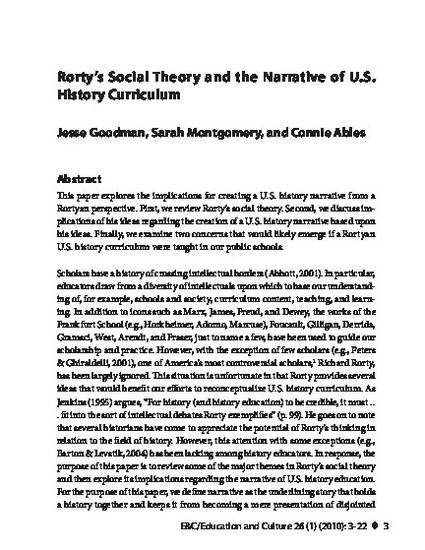 "Rorty’s Social Theory and the Narrative of U.S. History Curriculum"